Issue 11 has shipped, and all my Patreon backers should be getting pink envelopes of Dank in the mail soon. Back issues will be available soon in my new shop after I work out a few technical bugs. Here’s a handy Q&A thing I made up that will help to address some stuff concerning back issues of my Dank Zine. Q- Will you be reprinting issues 1-8? A- Probably not. I would need to do a bulk run print of the issues, and those start at a minimum of 100 copies. I would need to pre-sell around 50 to make this work. Reprints are unlikely, but that makes each issue highly collectable. Q- Can I still get issues of 9-11? A- Yes but I only have a limited number of issues to sell or for giveaways. Once they are gone from the shop, they are gone. Q- Will you make a digital copy? A- No. Digital copies change a lot of what a Zine is and what my vision for this project is all about. I am open to the idea of digital copies in the far future, but right now I am happy making physical media. Q- Will you do a compilation of issues 1-8? A- I haven’t put much thought or stock into making a compilation of the older issues. I am the kind of lady who likes moving forwards so if anything I would love to do some follow up interviews with some of the people who were featured in the pages of the first issues of my Dank Zine as they continue to grow with their projects and careers. Things I am working on are compilation art books but shhh!!! I don’t want to spoil everything. Here is the Dank Gallery for this week from all my featured streamers. Thank you to LordBBH, Macaw45, Lrock, capnClever, Chuboh, PJ and everyone for the stream. Please enjoy! A few years ago, my friend Tony shared a link with me online for something extraordinary. That was an online multiplayer for one of my fave Sierra games, Jones In The Fast Lane. It’s a quirky board game that has a strong “Game of Life” feel to it, and it has the strange yet amusing Sierra humour. It was incredible that I could play a classic old DOS game online with my friends. Jones in the Fast Lane came out in 1990 making it one of the first games for Windows 3.0 at the time. Its board game theme is inviting that players can quickly pick up the concept of going around the board. Your marble (player piece) travels around the board where you attain money, happiness and education to pre-set requirements at the start of the game. The name is a direct play of the idiom, “Keeping up with the Joneses” where neighbours/friends are always trying to out-do each other in their life. …and the sever stayed down. For two years. Until I started bothering people to fix it. I knew trying to set up my server was something I couldn’t do myself so I had to ask around in y circle of friends and find out who was up to the task of fixing the Jone’s server. My one friend, DanZeeMan, did the one thing none of us ever thought of which was to track down the people who made the online flash game and ask nicely for the server code. Well, not only did he get that but they were kind enough to send him the game as well! That rocks! I have been trying out the server on my streams as part of a fun new way to share in the fun of this game. Dan is also working on testing out a few mods for the game, and we’re even thinking about having a whole new updated Jones game to play online with everyone. Last Sunday, I challenged DanZeeMan and Omnigamer to a round of Jones so you should check that out here. Yeah, the title says it all. I have a replacement Blinking Light Kit arriving soon so I can get back to streaming my NES catalogue. Technically my NES has been broken for years, but I have been using a basic $20 Retron which “did the job” and did the job. My only complaint was that the new pins in those guys are TIGHT which ultimately lead to the quick destruction of this Retron. Oh well. Enjoy that mad spooky clip of my NES dying. PJ has Tshirts available in a new Teespring shop. Make sure you get your orders in quickly as I tried to get a yellow women’s shirt & it looks like I lucked out. That’s OK; I can get another colour cause I don’t want to chance not getting a shirt. I’m looking forward to getting mine soon. My buddy Mato has an update on his Legends of Localizations site where he took a closer look at some of the funny bad translations in Battle Rangers AKA Bloody Wolf for Arcade. For those familiar with the game, the translation is so bad it’s infamous within the arcade community. Do check out this story as I have always been a massive fan of Mato’s work over the years and he’s still got quality content just to spend hours reading. Try out the game yourself too and get a great laugh at its translation. Omnigamer is working on a new book called “Speedrun Science” which focuses on the history and philosophy on Speedrunning that is set to come out at Fangamer this Spring. 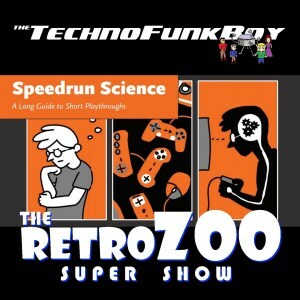 He recently was featured on the TechnoFunkBoy podcast where they discussed the book and touched down on his involvement in the Twin Galaxies Dragster controversy.